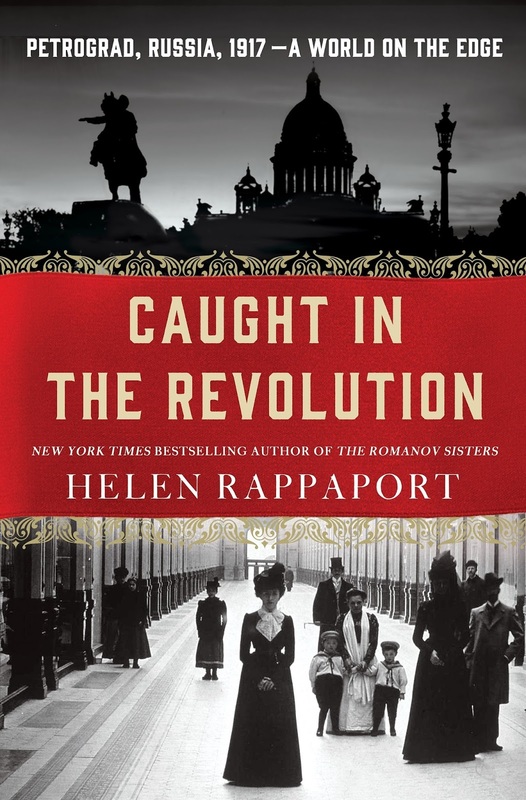 Helen Rappaport is the author of the new book Caught in the Revolution: Petrograd, Russia, 1917--A World on the Edge. 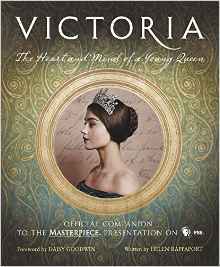 Her many other books include The Romanov Sisters, A Magnificent Obsession, and Victoria: The Heart and Mind of a Young Queen, the companion to the PBS series. She lives in West Dorset, U.K.
Q: Why did you decide to focus on Petrograd in 1917 in your new book? A: The Russian Revolution is a huge subject covering a wide geographical area. I had no desire to try and write a comprehensive study of the whole of Russia during that revolutionary year. This has already been done by academic historians and quite apart from that, such a huge wide ranging narrative would need years to research and write. I did not have the luxury of time. Besides, I am a social not a political historian. I wanted to write about the human experience of revolution, not the political theory. And I wanted to narrow the focus to the classic premise of time, place and action. Petrograd, the capital of Russia in 1917, was very much the centre of the Revolution and it seemed not only sensible but more dramatic to confine the narrative to this one city. Q: You include many different perspectives in the book, but you write that “there is one voice above all others that strikes a nerve in its own inimitable way,” that of Phil Jordan, who worked for the U.S. ambassador as a valet and chauffeur. What about him struck you as especially interesting? A: What I love about Phil, and many of the other eyewitnesses I found, is his absolutely natural, instinctive response to what was going on around him. He did not write his letters with any view to posterity. He just wanted to tell it like it was, how he himself experienced it out on the streets on Petrograd. He had no political agenda. His one preoccupation was preserving the life of the American ambassador to whom he was devoted. He looked at events in a very clear-eyed human way. His glorious idiosyncratic and untutored writing style lends his account an even greater immediacy. The letters he wrote are certainly the most vivid of all the accounts I read. I only wish we had more of them. Sadly I have no way of knowing how many letters he wrote from Petrograd, and of those, how many have been lost. A: It was a long hard slog of searching and searching — everywhere I could think of. Not just for books – memoirs, letters, diaries – that might have been published by eyewitnesses, but also tracking down what happened to the accounts of those I knew had been there. It took many hours of searching online and in library catalogues. In some cases material had survived in archives. I found a considerable amount of material in U.S. archives that had never been written about, let alone published, but it took a lot of searching to find it. It was a great joy to me to uncover completely new material from unknown eyewitnesses and to be able to give them a voice in my book. I also must say that without exception the librarians and archivists whom I contacted in the USA were incredibly helpful and supplied scans or photocopies. I could never ever have done the research by traditional means – just imagine me having to travel from the Hoover Institution in California, all over the U.S. and across to Harvard. It is only thanks to the Internet that this project, and projects like it that gather in a huge amount of scattered evidence, can now be undertaken. What surprised me? The candour, courage and good humour with which my eyewitnesses wrote about their experiences. None of them became preachy or political or complaining, nor did they run down the Russian people. Indeed, most of them had a great love for the Russians; it was the politicans they all despised, particularly the extremists. Almost without exception the British, French and American eyewitnesses I found shared a horror of the violence, and the hunger and suffering endured by ordinary Russians, and abhorred the advent of the new Bolshevik regime. Many of them had a very difficult and dangerous time in Russia, and some had a lot of trouble getting out. Q: What do you see as the most important legacy of the events you write about, which took place 100 years ago? A: Well it's a corny one — we have to learn from history. But sad to say we rarely do. The Russian Revolution is a great lesson in the corruption of the spirit of popular revolt, once the polemicists and rabble-rousers get a hold on it. It took a long time in Russia's case for people to realise what the revolution had unleashed. The Russian people had to endure 73 years of Soviet oppression before they rid themselves of it. And now they have a new kind of tyranny – the despotism of Putin. The revolution in Russia, as far as I am concerned, simply replaced one form of tyranny with another. There is no doubt that it was the most seismic event of the 20th century after the two world wars. It certainly changed the face of Europe, with the creation of the Communist bloc, and I often find myself wondering: if only Nicholas II had made political concessions. Even as late as 1917, had he done so, there might have been, indeed could have been, a different path for Russia. It might have evolved into a constitutional monarchy as we have in Britain. Things could have gone in an entirely different direction. The legacy, I guess, is ultimately tragic: the imposition of communist ideology on a vast swathe of Eastern Europe, on China, Cuba and other parts of the world. Thankfully the Eastern Europeans have largely now rid themselves of that yoke, but it still persists in parts of the world, as too does its ideology. 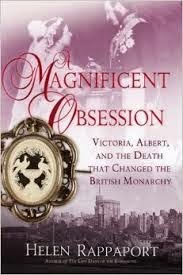 A: I am researching my third, and final, Romanov book. 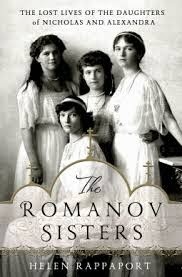 I had not intended to write another one after Romanov Sisters, but have increasingly felt that there was a part of the story that remains unresolved and needs to be explored and discussed. And that is: why did no one save the Romanovs? Why were the royal families of Europe unable to get them out to safety, or for that matter the Allied governments with which Russia was fighting a war? It's too easy to blame it all on King George V. The situation was a very complex one. I have been doing a huge amount of research in many unknown and previously untapped sources. I am casting the net wide in my quest to try and get to the truth. A: I was recently awarded an Honorary Doctorate by my old alma mater, Leeds University, so after the ceremony in July I can call myself Dr. Rappaport! 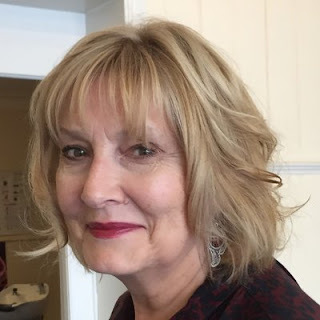 I will be promoting Caught in the Revolution on the literary festival circuit in the U.K. all year, as well as appearing in radio and TV documentaries on the subject. And I am delighted to be returning to the USA on a research and speaking trip in April. 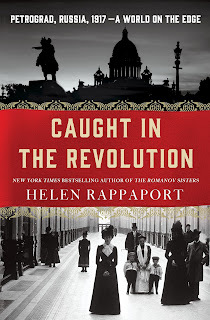 For details of all my events please see my website www.helenrappaport.com. You can also follow me on HelenRappaportWriter on Facebook, where I regularly blog about my work and things Russian that interest me. I am also on Twitter. --Interview with Deborah Kalb. For a previous Q&A with Helen Rappaport, please click here.